Xiaomi's CEO, Lei Jun, revealed some interesting figures last week that could shed some more light on the potential of their business model. While most of these figures refer to sales volume, we can also use them to gauge the potential of future services revenues -- Xiaomi's core monetization strategy. 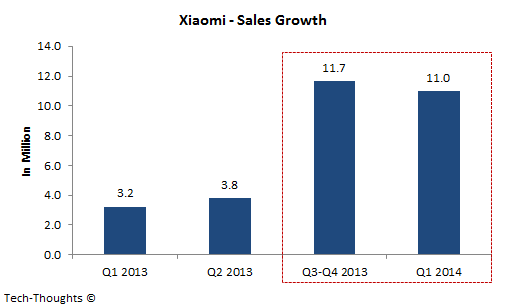 As per the chart above, Xiaomi's Q1 2014 sales volume has already matched that from the second half of 2013. It seems clear that Xiaomi's focus on innovating at lower price points and aggressive expansion into neighboring countries has helped them maintain exponential growth. Based on their performance, Lei Jun has increased Xiaomi's 2014 sales target from 40 million to 60 million. While Xiaomi expects to triple sales volume, its total revenues are expected to double from $5.2 billion in 2013 to $11.2 billion in 2014 -- this suggests that Xiaomi expects lower priced devices to make up an increasing share of their sales mix. How could this affect services revenue? 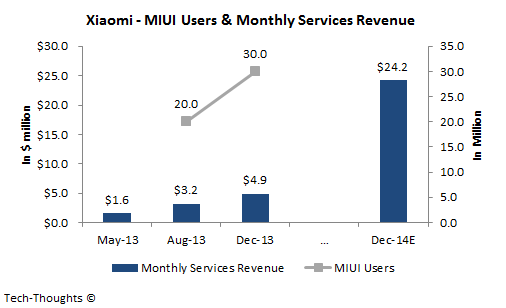 The chart above compares Xiaomi's monthly services revenue with the installed base of MIUI users. In August 2013, roughly 20 million MIUI users (of which 16 million used Xiaomi smartphones) generated $3.2 million in services revenue, i.e. the average monthly ARPU was roughly $0.16. By December, the growth in services revenue was entirely driven by MIUI user growth, as the ARPU remained roughly flat. Going forward, the growth in Xiaomi's sales is likely to outpace the growth in standalone MIUI users, i.e. 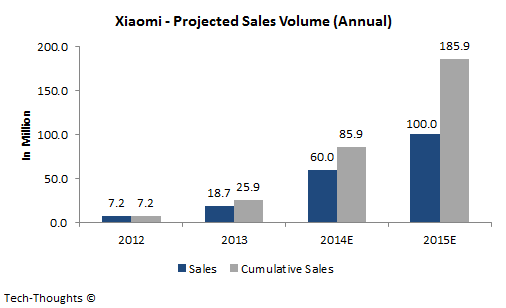 cumulative sales from 2012-2014 could give us a rough estimate of Xiaomi's expected install base. Therefore, in order to generate $24.2 million in services revenue in December 2014 from an install base of ~86 million devices, Xiaomi's monthly services ARPU would need to grow by about 75% to $0.28, even as average ASP declines. This could either be achieved by targeting increased service revenues from regions with higher purchasing power (e.g. Singapore, etc.) or by increasing the range of services that can be monetized. My guess is that Xiaomi will have a very busy 2014.